After our collaboration on Ink, I’ve had the pleasure of working again with ~in the fields, and written texts for two works in their current show at New Media Scotland, Inspace, part of the Edinburgh Art Festival 2012. 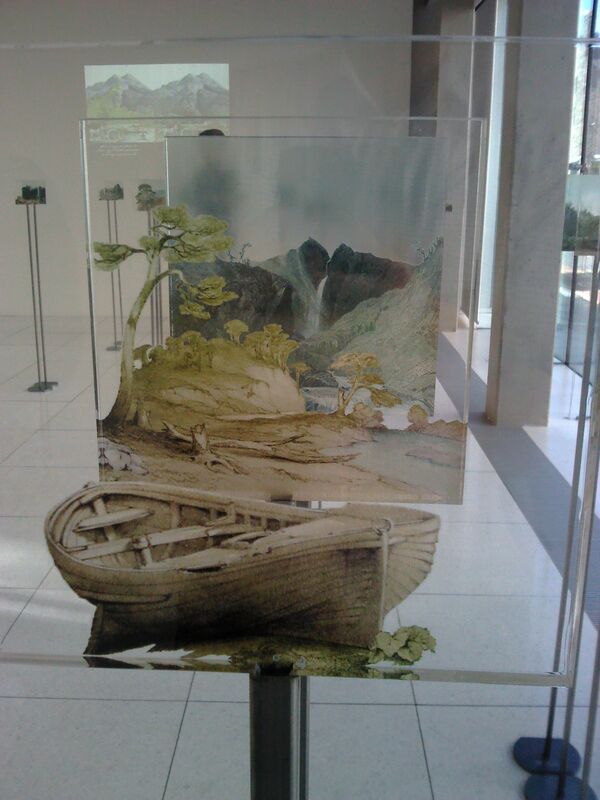 Yen To See Distant Places features ‘3D’ images – images literally made up of three layers, that is background, middleground and foreground, or ‘The Sublime’, ‘The Beautiful’ and ‘The Picturesque’. 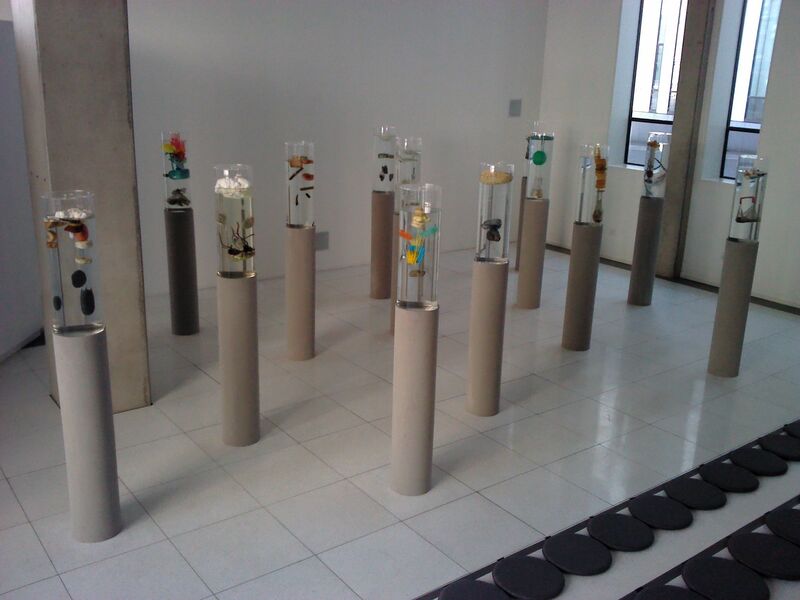 There are fifteen of each, so 45 in total, presented in the gallery on stands, and they can be physically moved. When three are placed in a particular spot on the floor, they are ‘read’ by sensors, which create on a screen a three-part composite image. Each ‘ground’ also has its own associated line of text, and beneath the composite image a composite three-line text appears. Just as the ‘grounds’ are adapted from 19th century engravings drawn mainly from Sir Walter Scott’s ‘Provincial Antiquities and Picturesque Scenery of Scotland’, so the lines are drawn from 19th century texts, especially Scott’s. I think of these little three-liners as ‘Romantic haiku’. 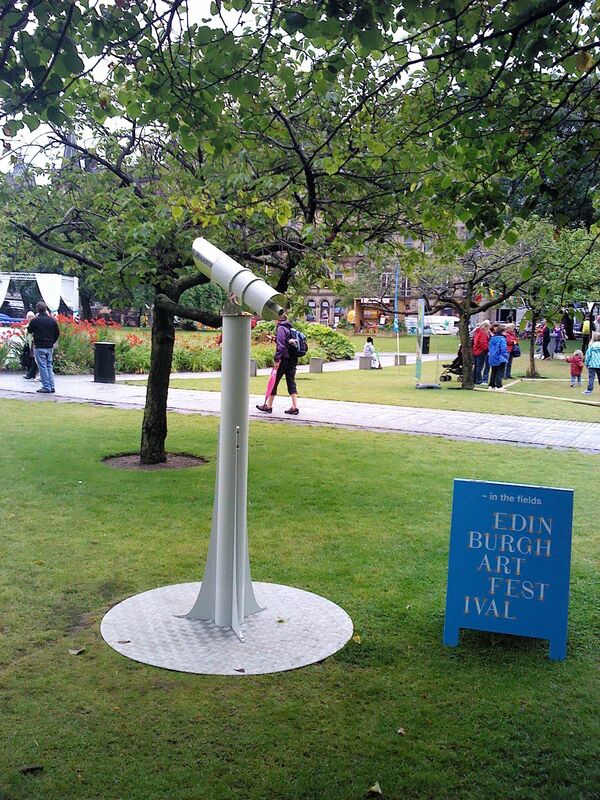 The composite images (though not, sadly, the texts) are then transmitted to St. Andrew Square where they can be viewed through a telescope located by the Edinburgh Art Festival pavilion. Drifts Through Debris is a modern take on the 16th century book wheel of Agostino Ramelli. Ramelli’s wheel was made to allow comparisons to be made between different texts – you could have several books open at a time, and by turning the wheel you could compare and contrast their contents. 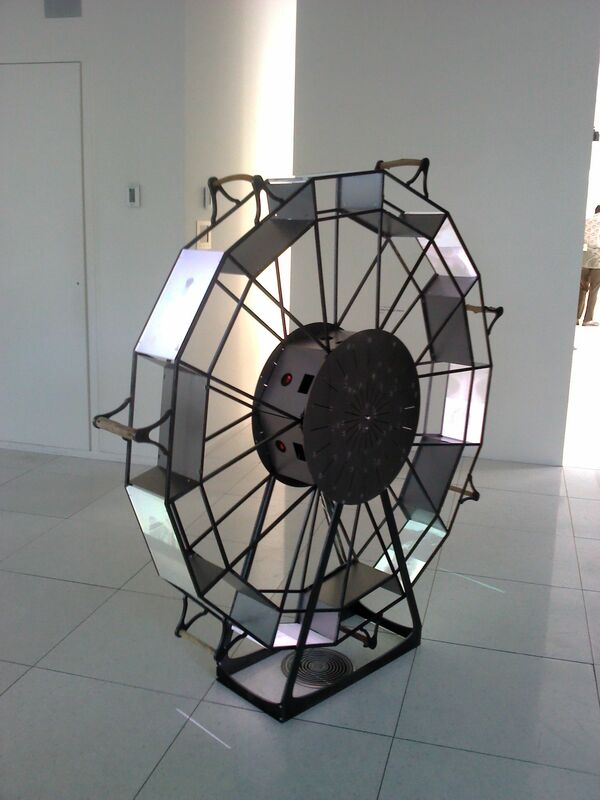 This wheel features video screens, and draws attention to the growing problem of oceanic plastic pollution. Footage includes archive material from the 1940s extolling the virtues of plastic as a way of utilising what would otherwise be waste products, and responses by two dancers – Sue Hawksley and Tony Mills – to images of sea-creatures constrained in various ways by plastic debris. 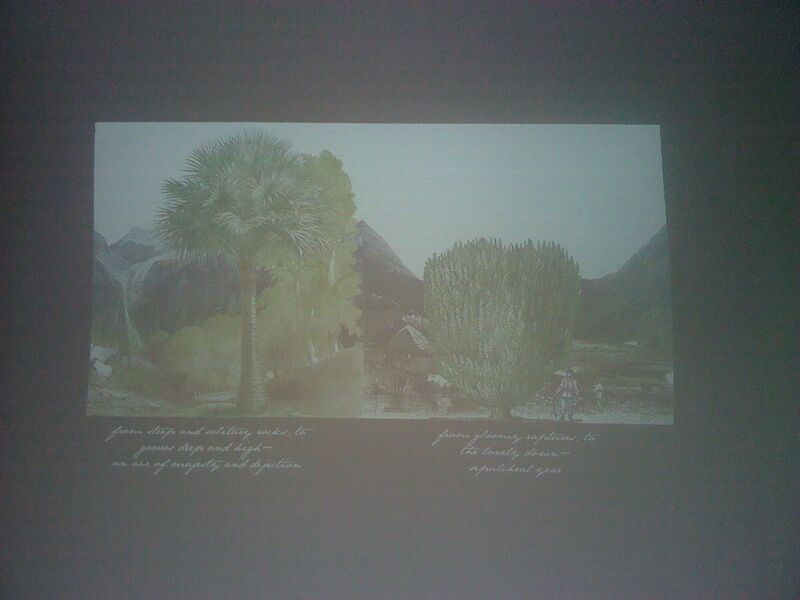 I wrote texts to the same images, and extracts from these are presented as part of the soundtrack to the video loops. The wheel is made of steel, with spaces at the hub for small projectors – a clever piece of contemporary design – but you turn it by pulling on handles made of driftwood, so it also has a nice tactile element to it. The third work in the show is A Diagram of Floating Stones – in tall, thin aquariums, lace-knit wrapped stones from Shetland beaches are given buoyancy by plastic found on the same beaches. I think it’s a great show – conceptually and visually strong, a fascinating mesh of old and new technologies, and acknowledging the gallery visitor as active participant rather than passive consumer. There are pictures of the opening, and of the works, here.